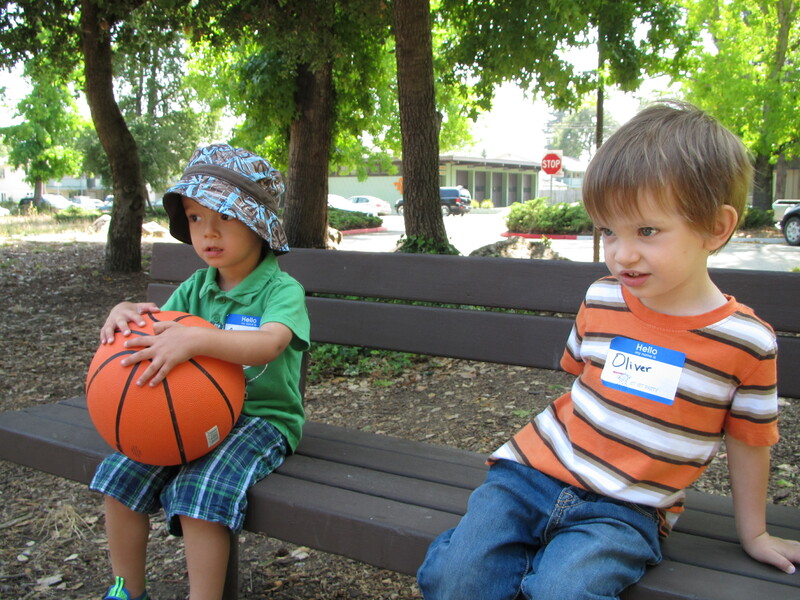 This afternoon we went to the annual Sutter NICU Jet Set Reunion. I have not talked much about either of my birth experiences on the blog, although I did snarkily referenced O’s in a rant about Adventures in Parenting. I had life-threatening complications and Oliver arrived via urgent c-section at 35 1/2 weeks after a failed 2 1/2 day induction. O then spent the first two weeks of his life with the “worlds best (and most expensive) babysitters” the amazing Sutter NICU nurses. They were awesome, and helped us through our incredibly difficult transition to parenthood. The support of the Sutter NICU staff does not end when you leave the hospital. Every year they hold a reunion picnic for the NICU “graduates.” They have a “raffle” (every graduate is a winner and gets to pick a toy donated by local businesses – this year O picked a bowling set), cake, ice cream or sno-cones, water, face painting, games and a chance to see other graduates and their parents. While O was in the NICU we befriended another young couple whose baby had arrived at 32 weeks. The little fellow was named Gavin James, which make it a little confusing when Gavin visited O and the nurses were talking to/about the little G in the isolette. We didn’t keep in touch with GJ and his family, once we left, we tried our best to put NICU experience behind us and get on with trying to function on a day-to-day basis. We do touch base once a year at the NICU picnics. Both O and little GJ are growing nicely and developing as they should. I enjoy the reunions because while O showed up at a skinny-but-developed 35 1/2 weeks, many of the children showed up earlier, and they turned out just fine. GJ’s mom and I tried to get the boys together for a 2 1/2 year post-NICU photo. This was our best attempt. GJ is on the left. What a cool thing for Sutter to do! I’m glad GJ is also doing well and I hope Oliver enjoys his bowling set. Hi there, I found this post when looking for info for this year’s reunion. My daughter is a 2010 NICU grad and I remember these little fellas from the 2011 one. It’s a wonderful thing they do for the kiddletts for sure. Nice way to continue with support after the nightmare of having a sick child.